What's an artificial island ? An artificial island is an island that has been build by humans rather than formed by natural means. Artificial islands can be created by expanding existing islets, construction on existing reefs, or amalgamating several natural islets into a bigger island. Dubai is home to some of the largest artificial island complexes in the world, including the three Palm Islands projects, The World and the Dubai Waterfront, the last of which will be the largest in scale. In Bahrain, between Qatar and Saudi Arabia, other spectacular islands are also emerging from the the Persic ocean. The network of artificial islands that is reshaping this segment of the Persian Gulf coast is the world's largest land reclamation effort. The islands were constructed of sand dredged from the sea bottom. This creation of new land where there was once water is possible because of the shallow depth of the gulf and the wide continental shelf off the Dubai coast. 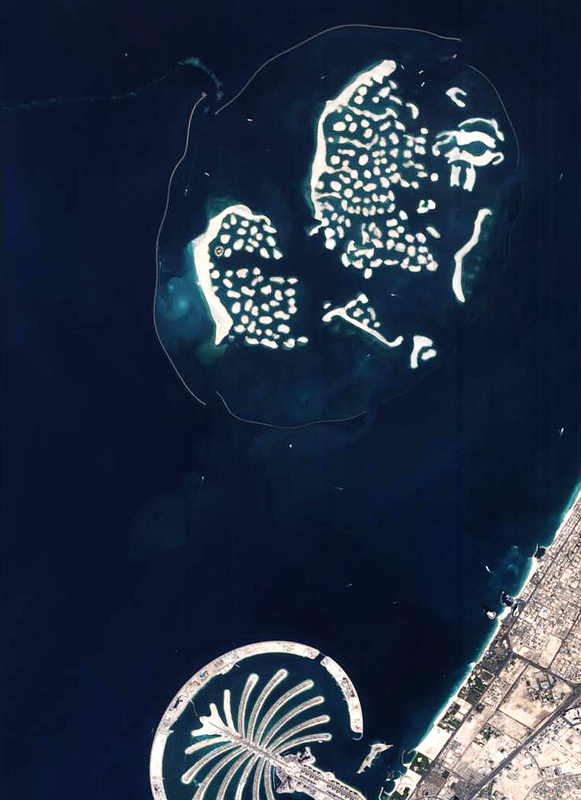 This Proba satellite image features the man-made islands located just off the coast of Dubai in the United Arab Emirates: Palm Jumeirah and The World (05/11/07). Source: N. Sullivan/SSTL through ESA.